The Jardin Francois is about an hour and a half's drive from us, and, having nothing to do this Sunday except take it easy, we decided to go and take a look. It's in the middle of countryside, in a slightly raised location, and has been thoughtfully and tastefully done. The owner also offers chambres d'hote in the restored buildings as well, so you can stay on-site and use the place as a base for exploring the area. The garden is moistened by a spring, and the owner has taken advantage of this in creating a network of small, linked ponds and water features. And since it is fairly acid, (pH 6.2 or thereabouts, he told me), there are Azaleas, Rhododendrons, and other acid-loving plants. The garden offers broad vistas, and smaller intimate displays - it works well on many scales. It is enhanced with well-chosen ornaments, and I liked the small collection of cast-iron hibachi barbecue grills. I also liked the home-made climbing rose frames made out of the iron rods used for reinforcing concrete (I could do that here!). A garden well worth visiting. And as a special bonus, we got to see a collared grass snake that was minding its own business sliding along just behind a piece of border edging material. I saw what I thought might be a beetle scooting along, and when I peered over the edging, I saw that it was the head of a snake. We surprised each other, and the snake disappeared promptly under a bush. Congratulations, Mark, your he-male has been selected for the prize draw from GED (Garden of Earthly Delights), Inc, for this month's special offer...... kidney stones! Boy, do they hurt. First symptom was a mild general gut pain - I thought I'd eaten something that was going to cause problems later. The later problem was curling-up pain, and a quick trip to the doctor who said it might be a gut spasm, gave me some pain killers, anti-spasm pills (both useless) and sent me off for blood tests. After the second wave of pain about a week later, he told me it might be kidney stones, and sent me off to get an ultrasound scan, that I booked for the earliest that I could, at the polyclinic, for a couple of of weeks' time. After one further wave of pain during the week while I was on holiday, I had no discomfort at all. So I turn up at the polyclinic, thinking "this is going to be a total waste of time, because the stone has gone now". And the ultrasound guy says, "Ah yes, you have a kidney stone. 9 millimeters. 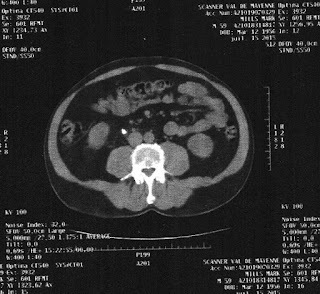 You need to have a CAT scan and an X-ray, and see the urologist". So I asked when I should come back for all of this, and he says "You stay here, we're doing them now" And they did. And when I get back to the reception area to pick up the scans, the urologist is there, saying "You're in luck, the sonic shockwave machine that breaks up kidney stones is expensive, and travels from hospital to hospital. It's here tomorrow. You get checked in tonight and I'll sort you out straight away." Which is how I came to spend two unexpected nights in hospital getting fixed. They only put me out when I was on the machine, it's quite an impressive device, it shows where the shock waves are concentrated, and they can scan it along the length of the stone. It makes a kind of clicking noise. 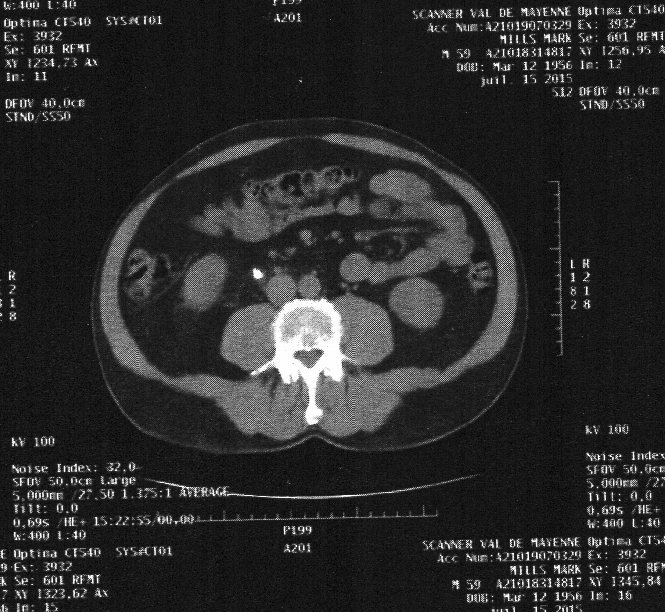 Now to be fair, the urologist did tell me they'd be putting in a probe, (they call it a probe (une sonde) but we'd call it a stent), and he told me that its purpose is to widen the kidney tubes so that the shattered bits of stone can come out more easily. He didn't tell me how it would be going in; that was something I worked out later. I suppose it should have been obvious. So the first pee after the op was a bit of a shock. Unsuspectingly, I just pointed and opened the sluice gates as usual. Big mistake. Not only was the output a glorious red, but it hurt like crazy. Next time I made sure I was on the paracetamol drip, and the release was very carefully controlled. So here I am at home, taking things easy, on a diet of pain killers, anti-inflammatorys and something that is supposed to make me pee less often. I'm using the time to sit at my desk and do a clean Win7 install on my PC, something I have been meaning to do for a long time, since it has been blue-screening fairly often. One of the things I like about the French health system is that your medical records are yours. I have here, the utrasound pictures, the scanner results, and the x-rays. I also get blood test results; pretty much everything that pertains to my health. My PC scanner didn't do a very good job of scanning the x-ray picures, but it got the CAT scan results showing the stone shining like a little star in the heavens. According to the doc, the inserion of the stent is achieved using stiff inserters so that it can get down all the tubes, which is why it hurts. The extraction, scheduled for three weeks time, is achieved with flexible extractors, is done under only a local anaesthetic, and doesn't hurt. Yeah right. I'm not looking forward. We stopped off there on our way to Carcassonne. I got two nice short-sleeved, collared shirts in the C&A sale for 15 euros (result! ), had a nice burger lunch at l'Atelier du Burger, and bought some coffee in the Nespresso shop. Culture vultures, us. I've always been impressed by the Nespresso ad campaign. It seems to combine poshness with a sense of self-parody - a bit of everyday posh, if you like. We wandered into the immaculate shop, and went upstairs (where the buying and selling and tasting is done), and there was a picture of George Clooney in person to greet us. All the coffees and machines were displayed in immaculate symmetry of design. You could even get a free cup of coffee to confirm your preference. Notwithstanding all that, I'm not sure that Nespresso isn't a bit too posh for plebs like us. No sooner had we gone upstairs in the shop than I dropped a massive fart, and Anita spilt her free coffee all over the counter-top. Never mind, as long as they continue to accept us for membership into their exclusive club, we'll buy their coffee cos it's good. I chose this cheese, a Basque "Ossau-iraty", at lunchtime in Castelnaudary, not far from Carcassonne. It was served with a little pot of black cherry jam. The cheese had a taste with a sharpness like Danish Blue, but somewhat milder. The cherry jam swamped the flavour, but was effective at clearing the palate to savour the next bite of cheese. I am spending far too much of my mental capacity trying to think of things that begin with "C" that relate to my holiday. 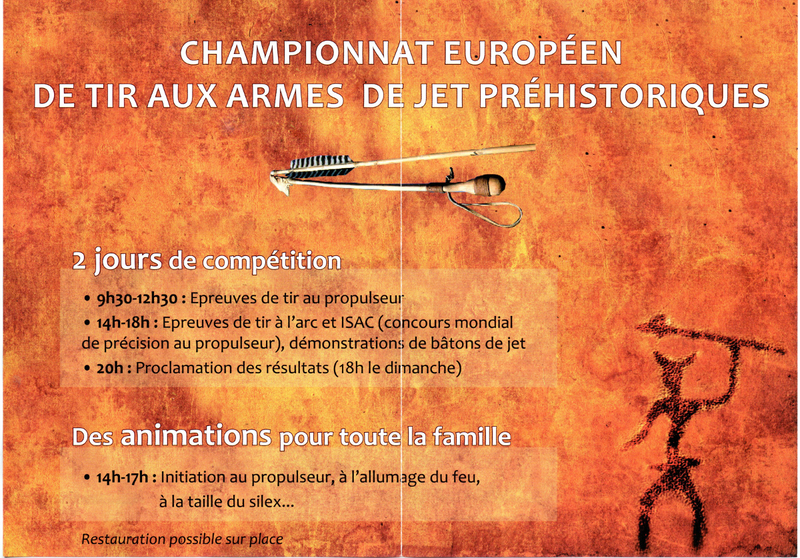 The European championships for prehistoric thrown weapons was held just down the road from us this weekend. We moseyed on down after our guests had departed this Sunday afternoon, to have a look. The weapons concerned are the bow and arrow, and the atlatl. I had to look up atlatl. By the time we got down there, it was bows and arrows only, fired at a series of targets on which were drawn pictures of prehistoric prey. 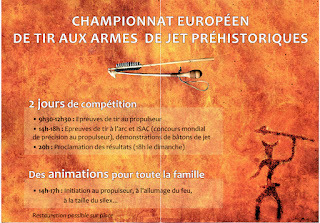 These pictures were distributed around the site, to be fired at from various distances. It was a low-key affair, with perhaps 15 competitors. It could be of course, that there had been more, and that those eliminated went home yesterday. I didn't get the impression that the weapons were especially powerful. It's easy enough for me to say, and I'm not pulling the bow, nor am I on the receiving end. But I think that although the turkey would have probably ended up in the pot, the competition with, say, the bear, would have been less one-sided. To my untrained eye, the guy in the foreground above was the best and the most on-target. He had a smooth technique; He didn't spend any time aiming with the bow drawn: he lifted the bow and drew it in the same movement, and loosing the arrow immediately at the end seemed like the natural culmination. To round off the holiday we had a fine meal in one of the posh restaurants in the medieval city. They served, amongst other things, a cocktail apéro, that, evidently, one is expected to consume by snorting. The little apartment we stayed in was tiny but functional. The kitchen had a fridge, hob, microwave and sink but no oven, but it served us well for the week we were there, and the pool outside was just what we needed in order to chill out after a hot day's touristing. Strictly speaking, Corbière wines don't come from Carcassonne, but we drank some in the cité, so I'm entitled to the headline. Carcassonne is within a wine-producing area that is responsible for Corbières, Fitou and Minervois among other lesser-known, smaller classifications. We couldn't come back without at least a small sample of the local produce. Our first stop was at the offices and warehouse of Sieur d'Arques in the town of Limoux (Where the scented garden is). They make a lot of sparkling wine and use the brand name Première Bulle to mark the fact that the first fizzy wine ever produced came from Limoux. The Champagne system uses a double fermentation to produce a strong wine with great effervescence. The original (pre-Champagne) method (discovered, presumably, in Limoux) uses a single fermentation and results in a mild (6%) and sweet fizz. Sieur d'Arques make both kinds, and we got some of each. Our other visit was to a warehouse run under the name Celliers d'Orphée, who seemed to be just opening for the tourist season. I was driving so I couldn't take full advantage of the tasting (had to spit the wine out, what a waste), but the numerous gold and silver medals plastered all over the price list seemed well-merited. We didn't buy a lot, but it's enough to be getting on with. It might last us a few weeks. If you are in the area, and take the slightest pleasure in gardens, then the garden of scented flowers at Limoux, about 20 minutes from Carcassonne, is well worth a visit. It's not a huge garden; it's tended by a husband-and-wife team in the mornings and is open to the public in the afternoons. It is divided into several areas; a dry garden, a veg garden, fruit trees, there is a pond, and there are sections given over to specific genus and other classifications of plants. The plants are labelled with a helpful description. This one, for the Cyclamen de Perse explains how its detergent properties were discovered first, and then it was noted that the fish in the river used for washing floated to the surface, making them easy to catch. And then it was worked out how to reduce the dose of toxin so that humans could eat the fish safely. The plants themselves are well cared for, weeds are scarce, and the paths are well-maintained. It's clear that it's the work of people who enjoy what they're doing and creating. Here's a few pictures. I got a special personal bonus on walking around - Last year I blogged about a house plant with a spectacular array of blue flowers, and asked if anyone knew what it is. I found one in the garden carefully labelled up. It's a Plectranthus 'Mona Lavender'. So now you know. It would be possible to spend many hours in the garden wandering about, discovering new vistas and shy plants. There is even a pretty, shaded sitting area, and you can buy cold drinks if you need to re-energise. But the garden also amply rewards a relatively short walk around. I came away feeling uplifted. I have a friend who drives a BMW. He tells me that the navigation system it comes with is crap, and he always uses his Tom-Tom instead. By contrast, I have always found the satnav on my Peugeot to be reliable and easy to use. I have discovered two minor faults. The first is that when directing you along switchback mountainside roads, it tends to underestimate the journey time quite severely, and secondly, if you choose the 'short route' option instead of 'fast route', it gives its sense of humour free rein, sometimes sending you down donkey cart tracks in order to test your courage, resolve, suspension and 4-wheel-drive. The Peugeot doesn't have 4WD. We chose the 'short route' option when travelling from Carcassonne to the suspension bridge at Millau. It had calculated 2 hours for the fast route, and 2 1/2 for the short route, so we figured we might as well take the slow road and see some scenery. It sent us down some very pretty switchback roads on the Black Mountain that is the source of the water for the Canal du Midi and we got to see some very fine scenery. But, despite my best efforts through the hairpins, the calculated arrival time moved steadily later and later, and, what with a stop for coffee, and to take some scenic photos, and then a slow lunch, we took from 9:30 to 2:30 to get there. But the bridge is worth seeing. There is a useful information centre you can visit, and several viewpoints where you can take photos. Concrete, like rock, is very good at supporting compressive loads, but is weak under tension. Pre-stressing the concrete is done by first stretching the iron reinforcing rods, pouring the concrete over them, and when it has set hard, releasing the tension in the rods. This gives the concrete greater strength under tension. There's quite a lot of it used in the bridge. OK, so it's not at Carcassonne. But it's not that far away. We came back the fast route. I like cacti, and had a small collection at one time. They are adapted to dry climates, and have evolved a special adaptation of the photosynthesis reaction. Normally, plants undertaking photosynthesis open their pores for the gas exchange that is a part of the reaction. For cacti, open pores in the daytime would result in too much water loss, so they do the reaction in two stages; the second stage that requires open pores they do at night. There is a cactus nursery not far from Carcasonne, at Montolieu, and we went to have a look. We were disappointed: the place looked to us like it had been neglected, and for some time. The website linked above promises an attractive display along a winding path in a greenhouse, but it was not to be found. There were the frameworks for greenhouses, but without polythene (or glass), there were many dead plants in pots, and the cactus garden outside looked unkempt. There were quite a few excellent specimen plants in pots, but I came away feeling a bit sad. The owner told us that the plants had suffered two weeks of -16 degrees a couple of Winters ago, which would have been devastating, and I got the impression that he might have lost heart. The Canal du Midi is a stupendous engineering project of the 17th century. Its purpose was to create a waterbourne goods passage between the Mediterranean and the Atlantic, bypassing the dangerous and expensive sea route around the Iberian peninsula via Gibraltar. The project was undertaken by a Mr Riquet who had no engineering qualifiations, no diplomas, no knowledge of hydrology; in fact no paperwork giving him any status at all as a canal builder. He was however extraordinarily rich, which, then as now, helped to overcome these little difficulties. He sank 3 million pounds into the project and left his family a further 2 million pounds in debt when he died. These were not small sums of money in the 17th century. It took 50 years for his family to pay off the debt, but after that they coined it. The first stretch of the canal (for which Mr Riquet is responsible) that linked the Med to Toulouse was opened in 1682, the connection to Bordeaux being made at that time via the Garonne river. It was much later (1857) before the entire route could be travelled on man-made waterways, and today it will take you about 15 days to get from one end to the other. There is no commercial goods traffic any more though, and the canal closes in Winter. Initially, the canal was not allowed by the city elders to come to Carcassonne, probably too Anglo-Saxon or something. However when they saw how rich their counterparts in Castelnaudary were getting on account of the canal dock there, they changed their minds. So the bit by Carcassonne is a later bolt-on, a kludge. We took a couple of the tourist trips on the canal; one up and one down. It's a relaxing way to see the coutryside, and the result is that I'd like to do the whole thing from sea to sea one day. We stopped off at this canalside house for lunch. It's situated just by a big sluice gate and a runoff channel that are used to drain the canal for cleaning. They did a nice goats' cheese salad that they served with the cheese heated up on what seemed to be honey-flavoured poptarts. It's a combination I hadn't seen before and it worked very well. They also sold a ragondin (musk rat, coypu) paté. We nearly got some for our neighbours who are plagued by these creatures in their garden, but we thought they might not, in the end, like it. Our long-planned break at Carcassonne coincided with the recent heat wave. (French for heatwave: la canicule) However, it was less severe in Carcassonne than elsewhere in France, reaching only about 33 degrees, and was alleviated by a stiff breeze. So although it was hot, it wasn't unpleasant as long as you weren't doing anything too physical. Carcassonne is a medieval fortress town that was falling into disrepair, its stones being carried off, under government permit, to be used on buildings elsewhere. This was halted by the enthusiasm of a Mr Mérimée, starting around 1830, and the town was restored over the following decades until it was finished about 1913. Although some of the styles used for the restoration were controversial at the time, the site won UESCO World Heritage Site status in 1997. In any case, it is now a major tourist attraction, its narrow streets lined with gifty shops, artisanal food and wine emporia, fashion boutiques, fine (and not-so-fine) restaurants and so on. The atmosphere is similar to Mont St Michel, without the religion. Although the tourist offices quote opening times, these apply only to the closed, chargeable areas, that is, the old keep and the chateau building itself. All the rest of the city you can enter at will and at no charge. It's an excellent place for chilling out with a coffee in the morning or a beer in the evening. And I'm sure it's quite a money-spinner for the local town. They must get plenty of fees from the many businesses there, and the car parks are seriously expensive by French standards. It's best to find free parking a short way away and walk there if you can, but under the heatwave we decided to take the heat in the form of the parking fees rather than the temperature. The nearby car parks are free after 8PM, so the restaurants fill up into the evening with locals as well as tourists. The lady in the artisanal nougat shop (above, right) was keen to improve her English, and pounced on us as we sampled her nougat. - "How do you say "Do you like" without saying "Do you like"?" - "How about "What do you think?" - "What does that mean?" - "Ok... What do you sink?" We bought some of her nougat for ourselves, and some for our friends who were doing a wonderful job watering our garden while we were away.